Colorado Gov. 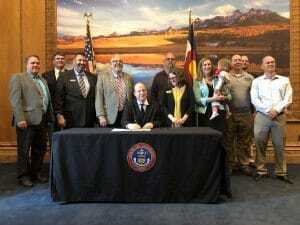 Jared Polis signs H.B. 1034 on March 21, a law making two-person freight crews required on the state’s rails. On March 21, 2019, Colorado Gov. Jared Polis signed legislation into law that requires that all freight trains in the state are operated by a crew of at least two individuals. The signing of H.B. 1034 caps a massive effort by SMART Transportation Division members that spanned years in the face of carrier opposition. 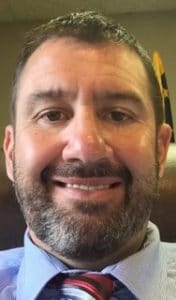 Smith and the Colorado State Legislative Board had an earlier two-person crew bill die in the state Senate in 2016, but tenaciously renewed their efforts early this year by gathering a broad group of supporters that included members from the six TD locals in the state, retirees, the Colorado AFL-CIO, Colorado Professional Firefighters, Conservation Colorado and American Federation of Teachers. H.B. 1034 was first introduced by state Reps. Tom Sullivan and Daneya Esgar on Jan. 4, passed committee and was initially passed, 39-23, on Feb. 5 by the full House. State Sen. Jessie Danielson was the bill’s prime sponsor in the Senate, where it passed, 19-15, on Feb. 25 after amendment. The House passed the amended bill again March 4 by an identical 39-23 vote, putting the bill on Polis’ desk. “Without these legislators’ understanding of the importance of this issue to the safety of our state’s railways, this would not have been possible,” Smith said. Also helping the cause was strong public recognition by Colorado residents and legislators that train crew size is a safety-oriented issue. On Jan. 9, the Colorado State Legislative Board released the results of a survey that showed strong support among Coloradans for a law requiring two-person crews. The survey, conducted Jan. 2 – Jan. 5, asked 550 random Colorado residents older than 18, using both cell phones and landlines, about issues centered around railroad safety. The results showed that 77 percent of Coloradans said that, given the chance, they would vote in favor of a two-person crew law. A website (www.corailsafe.com) established by the state legislative board and a coalition of TD members and members of other unions also assisted in spreading understanding about the importance of the two-person legislation in Colorado, which joins Arizona, California, West Virginia and Wisconsin as states that have legislation requiring two people to operate freight trains. The Colorado law takes effect July 1.